This is an opportunity to listen to the work of Jane Hirshfield, one of America's most outspoken and deeply influential voices in poetry, feminism and intellectual life. There will be an opportunity to ask questions and engage in discussion. Jane Hirshfield is an American poet and essayist, the author of eight much honoured books of poetry, most recently The Beauty (Knopf and Bloodaxe 2015), long-listed for the National Book Award, as well as two now-classic books of essays, Nine Gates: Entering the Mind of Poetry and Ten Windows. A chancellor-emerita of the Academy of American Poets, Hirshfield has been a visiting professor at Stanford University, UC Berkeley, and elsewhere. Her work appears in the TLS, New Yorker, Poetry, New York Times, and eight editions of The Best American Poems. Hirshfield is coming to Australia as a guest of the Mildura Writers Festival, where she will be making several appearances. She is also scheduled to do a reading at Monash University, Sydney University and a workshop at Writers Victoria in Melbourne. This public event is co-presented by the School of Languages, Literatures, Cultures and Linguistics in the Faculty of Arts at Monash University. 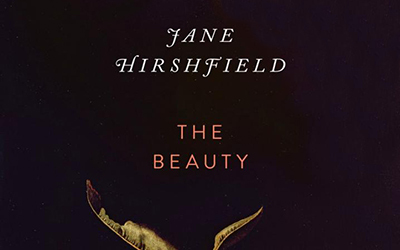 Jane Hirshfield is an American poet and essayist, the author of eight much honoured books of poetry, most recently The Beauty (Knopf and Bloodaxe 2015), long listed for the National Book Award, as well as two now classic books of essays, Nine Gates: Entering the Mind of Poetry and Ten Windows. A chancelloremerita of the Academy of American Poets, Hirshfield has been a visiting professor at Stanford University, UC Berkeley, and elsewhere. Her work appears in the TLS, New Yorker, Poetry, New York Times, and eight editions of The Best American Poems.